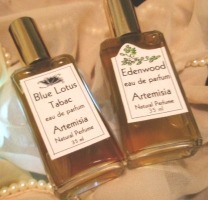 Blue Lotus Tabac and Edenwood are the latest fragrance releases from Artemisia Natural Perfume. Blue Lotus Tabac ~ "Blue Lotus is the representation of enlightenment and perfection. It is the centerpiece of Blue Lotus Tabac. The scent of the rare blue lotus is bright and sumptuous, deserving of it's lofty associations." The notes include ylang ylang, jasmine, mimosa, blue lotus, blonde tobacco, vanilla and choya nakh. Blue Lotus Tabac is available in Solid Perfume or Eau de Parfum.